Ben Needham Anonymous Reward. Do you have any information ? 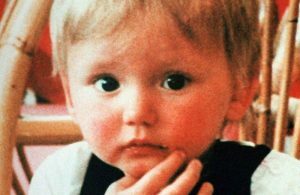 Ben Needham (born 29 October 1989 in Sheffield) is a British child who disappeared on 24 July 1991 on the Greek island of Kos. At the time of his disappearance, he was aged 21 months. After initial searches failed to locate him, he was believed to have been kidnapped. Despite numerous claims of sightings, his whereabouts remain unknown. In October 2012, South Yorkshire Police began to follow a line of inquiry which suggested that Ben had been accidentally killed and buried in a mound of rubble by an excavator driver working in a field adjoining the house where he was last seen. Extensive excavation of the rubble was undertaken by British and Greek Police. One item of particular interest to the police was a Dinky toy car, which they hoped to recover and believed could be “key to discovering his fate.” The search failed to detect any human remains or items belonging to Ben. There is no evidence currently available, to confirm that Ben died in the way suggested by South Yorkshire Police. DO YOU KNOW WHERE BEN IS DEAD OR ALIVE? CLICK HERE FOR DETAILS OF HOW TO CLAIM THE ANONYMOUS REWARD!